UN Secretary-General Antonio Guterres has asked decision-makers to focus on four key things - a solid plan, stepping up climate action, more funding and smart investment in the future of the planet. During the UN COP24 Climate Change Conference grand opening in Katowice, Poland on Monday, he told over 150 world leaders gathered for climate action that "we are in deep trouble." The two-week 24th conference of the parties to the UN Climate Change Convention (UNFCCC) technically started on Sunday, but Monday saw the high-level grand opening that also emphasised implementation of guidelines to build trust among nations. It marks the deadline for the 197 parties that signed the Convention to adopt guidelines for the implementation of the historic 2015 Paris Agreement, according to UN News. In the French capital, three years ago, countries collectively agreed to keep global temperature rises to no more than 2deg C above pre-industrial levels, and if possible, to limit the rise to 1.5deg C.
Now, in Poland, they have to agree on how they will achieve this collectively. "We cannot fail in Katowice," said UN chief Guterres. Kicking off the event, along with several other high-level representatives, he highlighted four key messages for the thousands of representatives of the world's nations, non-profit organisations, UN agencies, and private sector companies gathered in Katowice. The Secretary-General started by noting that climate change is already "a matter of life and death" for many people, nations and countries of the world, and that the science is telling us we need to move faster. Stating that "we have no time for limitless negotiations", the Secretary-General insisted on the need to operationalise the Paris Agreement, and reminded Member States that 2018 is the deadline that they set for themselves to finalise the guidelines for implementation. "We need concerted resource mobilisation and investment to successfully combat climate change," the Secretary-General told the delegates attending the COP24 grand opening, noting that three quarters of the infrastructure needed by 2050 for climate action still remains to be built. "All too often, climate action is seen as a burden," said the UN secretary-General, as he explained that "decisive climate action today is our chance to right our ship and set a course for a better future for all." At the framework of a Talanoa Dialogue, the six panelists, including Bangladesh Environmental Lawyers Association (BELA) Chief Executive Chief Executive Syeda Rizwana Hasan, Dr Nahid Rezwana of Dhaka University, Dr Sultan Ahmed of Ministry of Environment and Forests, as well as nearly 40 invitees were given a voice to share their stories, ambitions and engagements regarding climate change. 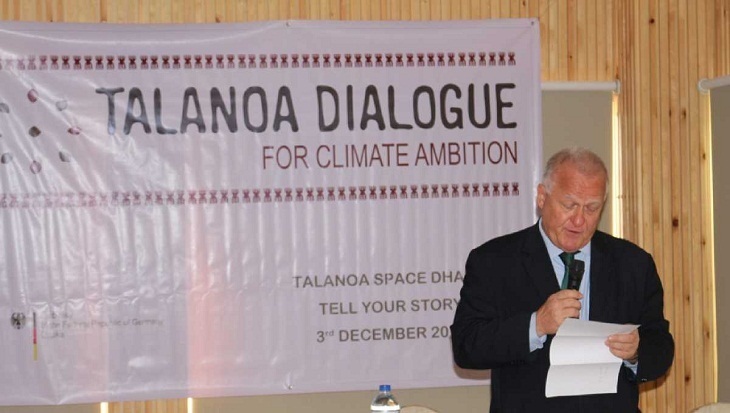 German Ambassador in Dhaka Peter Fahrenholtz stressed that the negative effects of climate change becoming perceptible for more and more people worldwide must immediately be taken seriously and must urgently be fought on a global level. The speakers highlighted the progress that Bangladesh has already achieved to counteract the negative consequences of climate change whereas the civil society repeatedly claimed that their communities would not yet sufficiently benefit from the efforts by government and industry, said the German Embassy in Dhaka.